Candy Group is implementing a structured industrial plan with an extremely precise vision: identifying and consolidating its leadership in strategic sectors (such as models with large loading capacities, slim formats, washer-dryers, top loading-appliances, etc.) in which the company can boast a true added value. 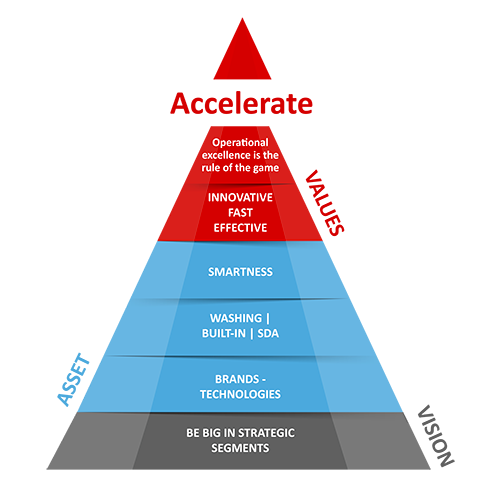 The strategy of Candy Group is visible in both its horizontal and vertical assets; technological innovation (in particular, connectivity) and the brand positioning of Candy and Hoover are elements found throughout the development plan, whereas the 3 pillars (washing, built-in domestic and kitchen appliances and small appliances) are future areas of focus. Candy Group has been a trend-setter in the washing segment of the global market from the invention of the very first Italian washing machine in 1945 right up to today’s range, a wide variety of Wi-Fi connected domestic appliances. The constant innovations developed have focused on automation, design and functionality, improving the performance of the products to guarantee enhanced efficiency and lower energy consumption in all the product lines dedicated to washing. Built-in cookers combine the solid values of the Italian culinary tradition with cutting edge performance, in line with the latest trends: perfect integration between domestic appliances and the kitchen, optimal space management thanks to large capacities, flexibility and innovative, functional design and the application of new technologies, especially those associated with connectivity. Hoover invented the very first vacuum cleaner; the second largest brand in Europe in the segment of small domestic appliances, it has its own in-house research and development department. The Hoover technology is patented with product characteristics acknowledged as unique in the market. As a “specialist”, the Hoover brand offers a wide range of products for cleaning floors and other surfaces: vacuum cleaners, carpet sweepers, floor cleaners and steam products; in 2010, Hoover also made its début in the ironing system segment. The cooling sector aims to develop domestic appliances capable of establishing new standards by redesigning the traditional refrigerator and transforming it into a smart appliance for storing food as effectively as possible, constantly improving storage conditions and always finding simple solutions for every kitchen requirement. It always has a food storage solution ready, regardless of the number of family members or their habits. A wide range with a spectacular design, capable of satisfying every requirement and adapting to cater for every style.